Google has always been a company focused on organization and ease of use, their fice inbox tabs don’t disappoint. With Gmail's inbox tabs, Google gives users the opportunity to better organize old and incoming mail so that they can spend more time on important emails and less on ones that are not as relevant. Currently, the five organizational tab options available include primary, promotions, social, updates and forums. When using these five tabs and an algorithm created by Google, users will experience a more organized setup. Let's dive into each of the five tabs to see how it helps you keep track of emails in your inbox. As always, Google allows room for customization, giving users the ability to move emails between tabs. Once you’ve moved an email into a different tab, Gmail will automatically memorize the address it came from, and send future emails to the new tab as well. Another option Gmail provides is to let starred emails be categorized into the primary tab. This may be a great tool for someone who is accustomed to having all of their work emails in one place. However, if you do try it out and discover that it’s really not your cup of tea, you can always go back to Gmail’s original inbox, or any of the other current variations provided. The end goal of this product is that you will have to spend less time organizing emails and will experience less email fatigue throughout the day. This option allows you to mass-delete or mark emails of a certain type without having to uncheck other types. Additionally, you can quickly see numbers for inbox counts and unread mail for each category, overall, creating a more time-efficient experience with their program. Google is gradually rolling out their new setup to desktops first and then to mobile platforms including Apple and Android products. Eventually, all devices will support the new feature including desktops, mobile phones and tablets. Interested in Trying Them For Yourself? 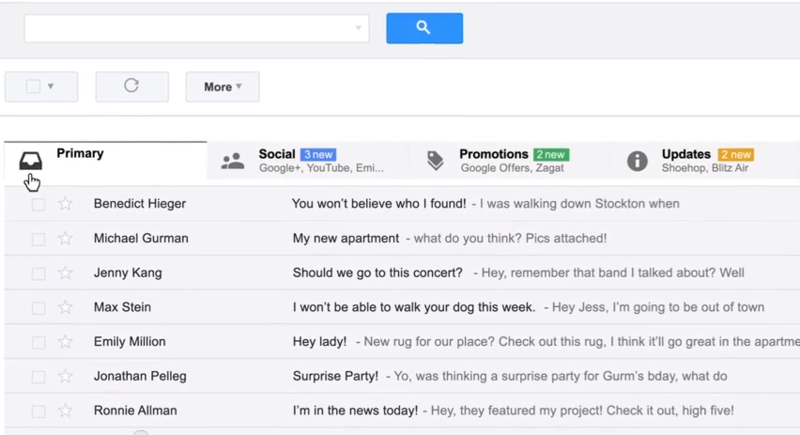 To set up Gmail inbox tabs for yourself, follow the simple steps below. Choose the option “Configure Inbox” – Keep in mind, it may not have rolled out to your platform yet! If you don’t see this option, check back soon to see if they’ve updated for your platform. Samantha Winchell is a former New Breeder.